The Bermuda Triangle…it conjures up thoughts of what else…Bermuda. Sandy clean beaches, beautiful crystal clear water, fruity drinks with tiny umbrellas in them, tropical breeze blowing gently…what??? That’s not what you think of when you hear the words Bermuda Triangle??? So let me guess, you must think of strange vortexes that swallow up planes and ships with all occupants on board never to be heard from again. Well I wouldn’t and couldn’t blame you if in fact that is what you think about when those words are mentioned, but I bet you never thought of Alaska. Oh yeah you read that right, there is supposedly a Bermuda Triangle in Alaska, so for all purposes it is the Alaskan Triangle and has been doing the same type of damage for years…it just doesn’t get as much notoriety as its tropical counterpart. So the Alaskan Triangle stretches well over hundreds of miles between the towns of Anchorage, Barrow & Juneau. It came to its most prominence over 20 years ago, 1972 to be exact, with the disappearance of a plane carrying prominent politicians House Majority Leader Hale Boggs and Representative Nick Begich along with the experience bush pilot. They searched for the 3 men for over 35 days and ended up calling off the search and declaring all men deceased. No trace ounce of evidence of them or the plane has ever been found and I don’t think there ever will be. Now some say that the infamous head of the FBI J. Edgar Hoover was in fact responsible for covering leads to the missing men because of his hatred and constant battles with Boggs in the political arena. Now this type of political espionage and secret plots surrounds Washington more than any other government in this entire world. There have been over thousands of recorded missing people in the Alaskan Triangle some either hiking or some flying they have all disappeared without a trace. Now it could easily be chalked up to the harsh climate of the Alaskan wilderness and it multitudes of wild animals willing to eat any potential human who gets lost on their way and the winds and weather in the mountains could easily down a plane without ever trying. So yes, it is quite possible to easily explain the rational to all these people going missing, but to find no trace of any plane or person in all the thousands if missing people cases associated in the area of the Alaskan Triangle, now that seems a bit odd to me. With the technology of today and we can find a single piece of material associated to a missing person leaves me a bit puzzled. Again, though like its counterpart in Bermuda no traces of the ships, planes or people have been either so it isn’t that farfetched after all I guess. Could the discovery of a Huge Underground Pyramid in Alaska’s mysterious Bermuda Triangle region be the cause of thousands of missing people? On May 22 1992 Chinese Set Off Their Biggest Nuclear Explosion weapons testing program. A huge underground pyramid was identified during the ,Chinese underground test it was much larger than the Great Pyramid at Giza. There are huge number of disappearances in Alaska, We are trying to figure out why, people are being abducted and not returned. Because so many go missing in Alaska, part of the wilderness has been called the Bermuda Triangle. Thousands of people go missing each year but is there really a mystery here? According to their folk-lore there exists a man, known as Kushtaka who can shape-shift to an otter and has the ability to lure innocent people and trap them. This theory surrounded by the amount of missing persons list that the state puts up is enough to confirm and verify the truth about Alaska’s Bermuda Triangle. The region’s statistical data of 2,883 missing persons is adequate proof about the insolvability of Alaska’s Bermuda Triangle. The state ranks 50th among the nation’s population count. Despite its supposedly ancient provenance, evidence of the black pyramid’s existence didn’t appear until 26 July 2012, when reporter and cattle mutilation expert Linda Moulton Howe announced its discovery on late night conspiracy radio talk show Coast to Coast AM. That evening, Moulton Howe broadcast a pre-recorded interview with Doug Mutschler, “a retired U.S. Army Counterintelligence Warrant Officer,” who provided many of the initial “facts” (those are sarcastic quotes) about the pyramid, and first alleged the site’s current connection with the U.S. military. According to Mutschler, geologists had used the detonation to undertake a seismographic study of the earth’s crust, only to find “a pyramid structure larger than Cheops” underground, somewhere west of Mt. McKinley. Mutschler recalls that the local NBC affiliate ran a story announcing the structure’s discovery about 6 months after the detonation, but when Mutschler attempted to follow up with the station to get a copy of the story (evidently not as part of his duties at Fort Richardson) they denied that the story had ever run, and asserted that they certainly didn’t have a copy to provide. Mutschler then called relatives to track down copies of the story that had run on other stations, but apparently none had: the discovery only appeared on Anchorage’s Channel 13 (in case you need to add some numerological significance to the whole thing). Douglas A. Mutschler gives proof of who he was and tells there is a Ancient Pyramid in Alaska bigger than the biggest one in Egypt. Located between Nome and Mt. McKinley. The Alaskan underground pyramid is HOT and HUMMING, an active underground base, run by who or for what reason? These are Questions that we are asking and want answers to! From: Douglas A. Mutschler Subject: To Linda Moulton Howe, Pyramid under Alaska? Date: June 22, 2012 To: earthfiles@earthfiles.com My name is Douglas A. Mutschler CW2, USA (ret) and during my service tour in Alaska I was informed of a pyramid under the land in Alaska. There is other information concerning this that came to my attention after it was reported to us in 1992. I have tried to pass this info to others but have not heard any response to my information. I assure you I am telling you the truth about this and I think that this is being kept quiet by our government as the news was buried the very next day after it was brought to my attention. If you can help me get this info out to you please call me so I can talk to you about this. My phone number ——-. The whole story is pretty interesting and this can be verified with your contacts I’m assured of that, as I do not have them and came up with zero from the news people there. I’ll tell you the whole story if you are interested. I’ve only contacted a couple of people but have not heard back from any of them. I’m wondering if my emails are getting through to them or is this an old story that has no interest to news reporters? So is there in fact a pyramid under Alaska? 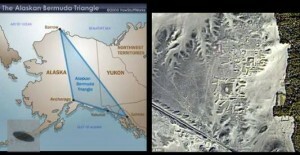 Is there truly a Alaska Triangle wrecking havoc in this world making people and planes disappear without a trace?